So spec of the clio there will be stuff I've missed cause it's endless. CLIO TURBO MEGLIO Clio 197. Liquid yellow 414/500 92k on the shell with full service history. Recaro's "slightly worn" with trs harnesses. Red brembo's with ds1.11pads. Reyland 330mm big brake c hook disc. 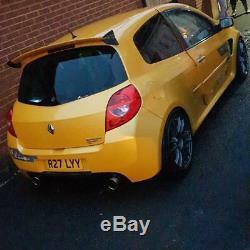 Cup spoiler with rear carbon endplates.. Genuine renault brand new splitter Genuin renault side skirts. Stripped rear with full carpet made Whiteline rear strut brace. Vibra technics rear gearbox mount. Vibra technics top engine mount. Black series insert gearbox mount. Wheels 17 calibre gram lights with AD08R tyres. 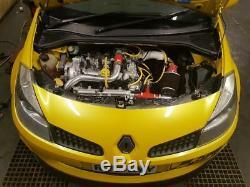 Engine Megane r26 engine with full service history.. Cam belt water pump done last year. New style oil feed pipe. Aircon delete running a stretch belt Ramair vac pipes. Brand new Forge hard pipe kit. Big 95mm core airtec intercooler. Single mass flywheel and updated clutch. 3 scorpion decat heat wrapped. 3" scorpion link pipe Into custom rear exhaust on a quick release v band 4" tips Megane r26 gearbox with the LSD. The car gets used daily and drives fantastic! The car will benefit from a remap that I've not got round to doing yet. I also have 630 injectors ready to go in when getting mapped. I have a genuine handbook for the car full of receipts service history! Also have the genuine handbook from the car the engine came from with full service history recipes ect! Along with endless amounts or paperwork for parts bought for doing the convertion. 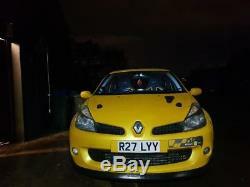 The car can come with the private plate for the asking price. Anymore info needed or require anymore pictures feel free to give me a message. Call George on 077.52789.459. 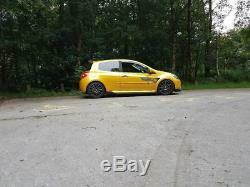 The item "PRICE DROPRenault Clio sport 197 f1 R27 turbo meglio" is in sale since Wednesday, January 16, 2019.